North Boulevard is a corridor in Downtown Baton Rouge that was characterized as having extensive pavement, small sidewalks, and large, mature Live Oak trees. The adjacent Galvez Plaza was designed and built in the 1970s and, despite being the site of free, weekly concerts in the fall and spring, was outdated and no longer served the public well. 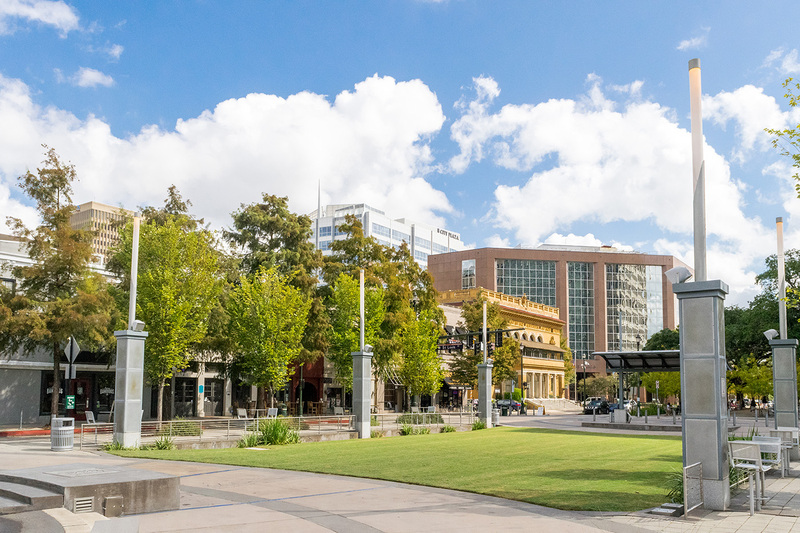 The City of Baton Rouge hired a joint venture team led by Dana Brown & Associates to re-envision the entire area as Town Square, creating a social and economic center in the heart of the city. 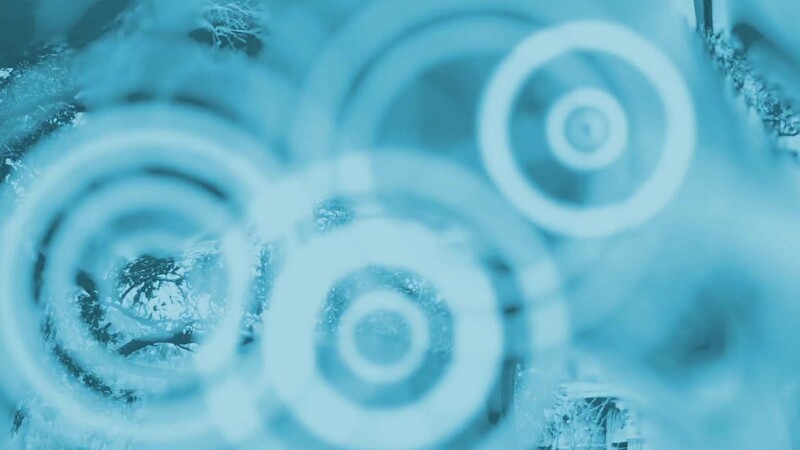 Nearby blocks had just begun experiencing reinvestment. 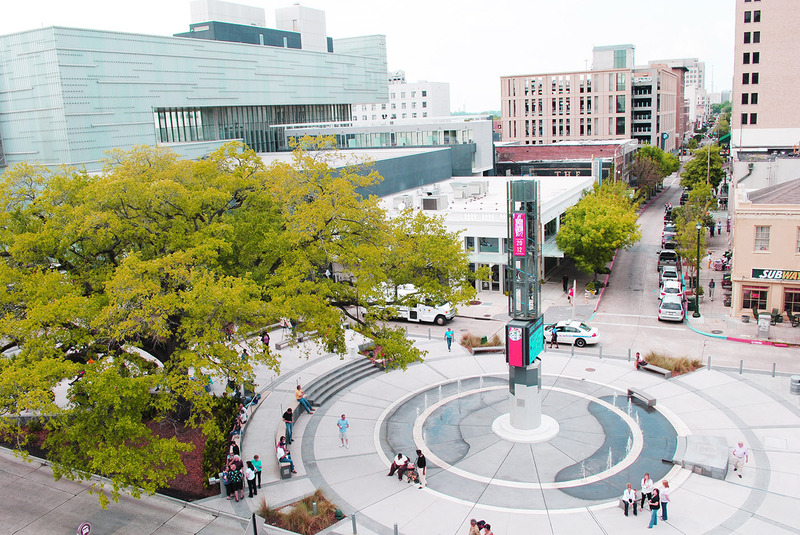 Town Square, composed of five blocks of North Boulevard, is home to the downtown library, the Old State Capitol, the Shaw Center for the Arts, and River Road. 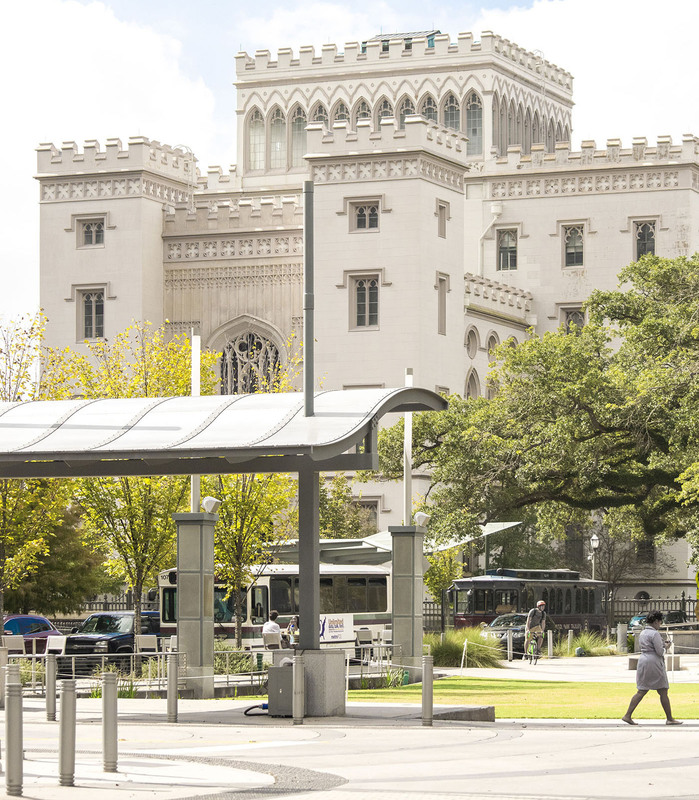 It is a key component of the revitalization of Downtown Baton Rouge because its center is located at the intersection of North Boulevard and Third Street, historically the commercial corridor that connects the River Center Convention facility with the Louisiana State Capital. Dana Brown & Associates, as lead consultant in the Joint Venture, designed and managed implementation of almost $6 million in improvements for Phase I along with $2.5 million in LA DOTD Transportation Enhancement funds to improve two additional blocks in Phase II. 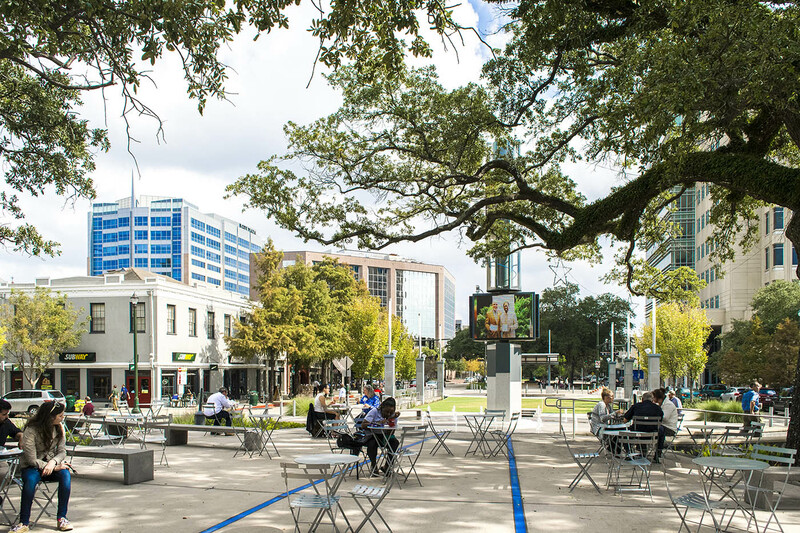 The design, which attracts downtown workers, library users, residents, and visitors all day and into the evening, incorporates sustainable elements through the extensive use of low energy LED lighting, stormwater management, maximized pervious surfaces, and green spaces, as well as preserving and enhancing the urban Live Oak canopy. 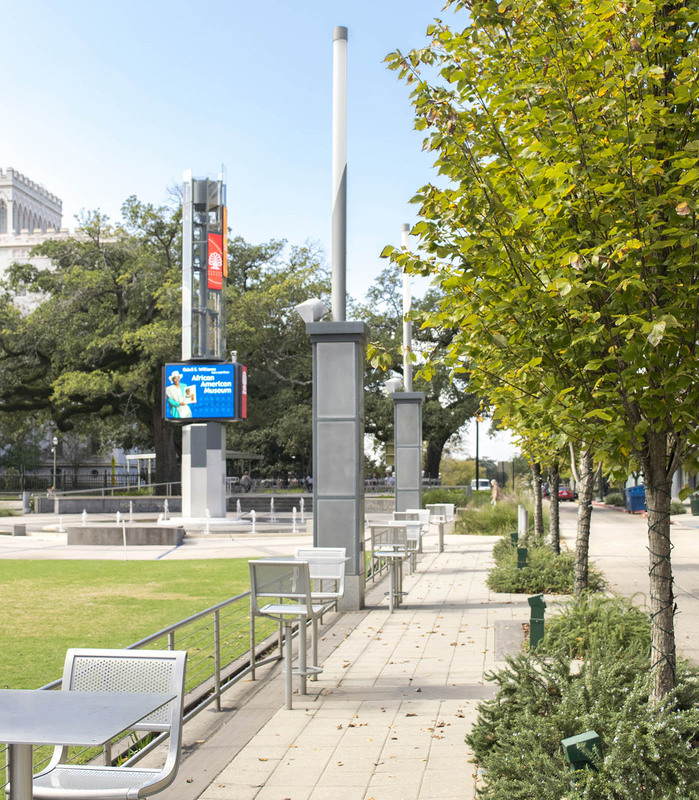 At the historic intersection of North Boulevard and Third Street, once a lively commercial corridor, the designers created a beacon tower with multiple LED displays, lighting effects, and a perimeter fountain. The design also incorporates ultra-urban bioswales along North Boulevard and an elevated Live Oak plaza, constructed to protect the trees from soil compaction and provide additional air and water to their roots. Town Square converted over one acre of street paving into seamless pedestrian spaces that employ universal design principles for ease of access and movement throughout. Large green spaces and native trees accent the historic buildings and views of the Mississippi River. Phase I of the project has been open to the public since 2012 and has proven to be highly successful, drawing people to Downtown both day and night as well as attracting hundreds of millions of dollars in private investments in commercial and residential development in the area.